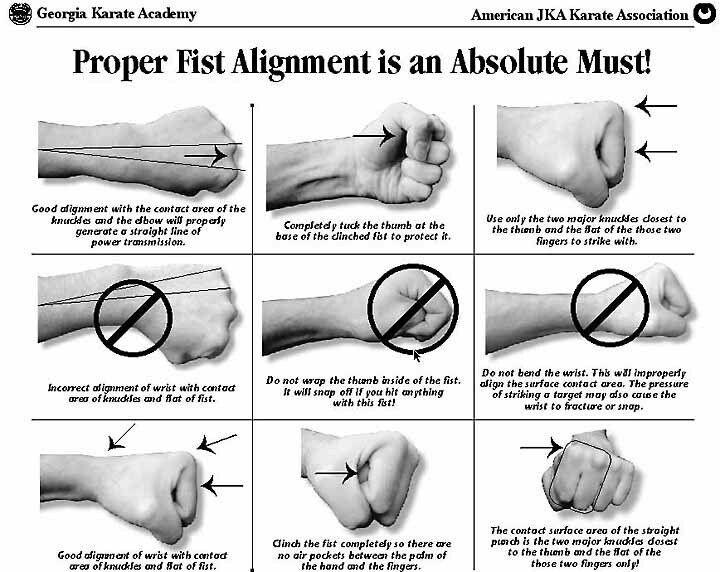 Proper Fist Alignment is an Absolute Must! The fist is one of the karate students most important weapons. The hand can be used to make a variety of fists, the hammer fist, the one-knuckle fist, and the straight fist, just to name a few. Many injuries can occur without a good understanding of the basic elements that make a good fist. 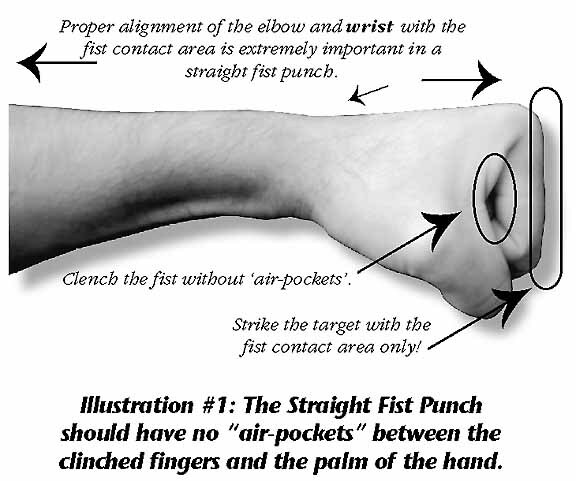 While each type of fist has it's own set of particulars that make them different from each other, there are three principles that apply to all types of fists: 1 - clench the fist without air-pockets 2 - align the elbow and wrist with the fist contact area 3 - use only the proper part of the fist contact area to strike the target As I have already mentioned, there are a variety of fists for a karate student to become familiar with. However, for simplicity, illustration #1 refers to the most common fist, the one every school teaches the first day student, the straight fist. Of the nine illustrations below (illustration #2) six point out the correct method of applying the three key principles mentioned above and three of the illustrations point out the most common errors inexperienced students generally make.